The distinctive flavor of Church Chicken is tantalizing. This unique taste is not because of any special seasoning or condiments used, basically it is the method used in preparing the chicken. To prepare this amazing dish your first step would be to prepare the coating for the Church’s Chicken. Take all the dry ingredients mentioned in the ingredient section should be put in bowl now take a spatula and mix all these ingredients well. After thoroughly mixing them, put the bowl on one side. Now let’s start preparing our chicken. Take a bowl and pour the cold water in the bowl now comes the important point which you should not forget because this is what adds the extra zing is to make sure that the water should be very cold. Now take the eggs and mix these eggs in the very cold water, keep stirring till they blend well and the mixture gains a frothy consistency. This should be properly done because this mixture is going to give that thin paper like skin texture for the Church’s Chicken. Now take a pan for frying your chicken. Pour the oil in and start heating your pan. Take the cut chicken and dip them into the eggs mixture you have prepared and then sprinkle it with the dry mixture and make sure that the piece is thoroughly covered. Now wait till your chicken pieces reach the room temperature. Once they do they are ready for frying. Now take the pieces and start frying them in the oil which you had kept in the pan for heating. 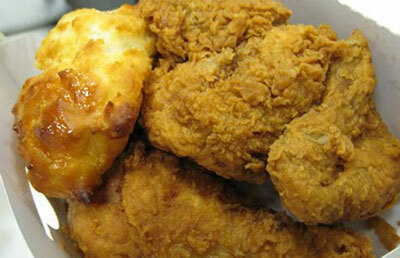 The chicken pieces should be fried till they are consistently brown on all sides. Put all the fried pieces on a dish. Now take a baking dish and thoroughly baste it with oil. Transfer all the fried chicken pieces in the baking dish. Seal your baking dish properly with a foil from all three sides Bake it for 45-50 minutes at 350 degrees. Now for a crisper coating remove the foil and bake for another 5 minutes. The final step is to take the chicken pieces and place them on clean paper napkins to drain. So now you are ready to savor your delicious Church’s chicken!